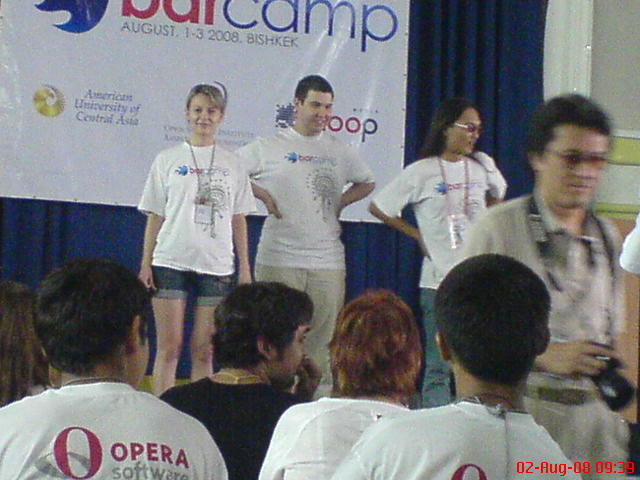 On You Tube you can find several short scenes for example of the opening of Barcamp Bishkek, photo’s and reports of bloggers. 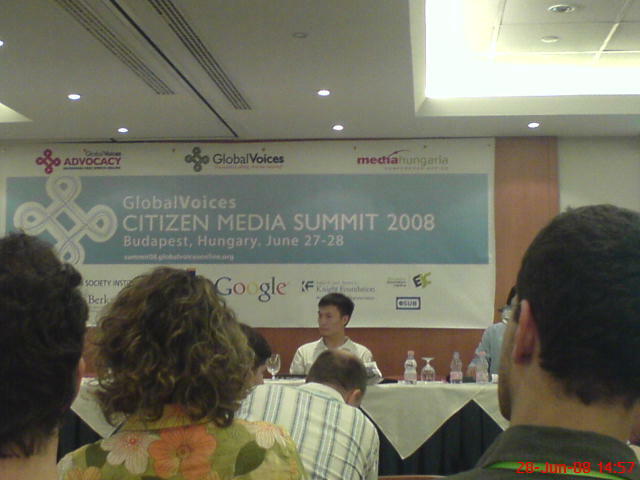 About 200 bloggers, activists, technologists and journalists of around the world – most of them contributors to Global Voices Online – travelled to Budapest the last weekend of June. The GV Citizen Media Summit 2008 brought them together for two days of public discussions and workshops. It was a wonderful, energetic, diverse and fascinating gathering. Light-hearted in a serious way. Optimistic and creative despite difficulties and uncertainties. Lots of stories, videos and more can be found via on the Global Voices pages. – who needs press freedom in booming economies, like Singapore? So what to do when your society is not interested in politics, freedom of expression or activism in general? – Often torturers of bloggers do not have a clue how the internet works. In one example (Morocco) their leading question was: ‘why did you invent Facebook.com’? Comical if it wasn’t so tragic. For a good impression of the discussions and the atmosphere have a look at ‘The right to blog‘ (pdf), an excellent article of Evgeny Morozov. I also recommend the blogs of the co founders of Global Voices Online; Ethan Zuckerman about collective decision making, the day after the summit; and Rebecca MacKinnon on ideas related to global participatory media. The Summit 2008 was realized by Georgia, Solana, Sami and David. For dessert: some really nice photo’s (203) made by Neha Viswanathan. Steppe Magazine contains wonderful photography and is beautiful designed. On top of that, the well written articles are an intelligent sharp selection of the current affairs in Central Asia. Last week I received the winter issue, and again it was a great read. It will be no surprise that I especially can recommend ‘Steppe Blog Guide‘, this article gives a nice and clear overview of the blogging scene in Central Asia. Also on the web pages of the network of weblogs NewEurasia, you can find the online Central Asia Blog guide, a fine list of useful, relevant and lively weblogs. 01/09/2007 A Disturbing Reality Check: how open is the internet? In Europe we take free access to the web, IP telephony like Skype and e-mail very much for granted. You get on line and expect it to be there and working. Yet, in countries like Tunisia, Egypt, Iran and China access to the internet is getting more and more restricted as the governments build firewalls around content they don’t approve of. The technology to empower the citizen, but also to block access, is getting moresophisticated by the month. Is the internet in danger of becoming much less open, transparent and therefore useful? Main questions for this workshop are: how to guard freedom of expression on line? How to support (citizen) journalists reporting and publishing their opinions without fear of censorship or persecution? Are there ways of balancing the good and evil aspects of the web, or is it just a reflection of society in general? No wonder internet is still a medium for the happy, and more often rich, few in Kazakhstan. Only 4 % of the Kazakhs is wired, due to the high costs. An dial-up plan costs the Kazakh customer 82 euro a month. The low bandwidth and the average monthly salary of 292 euros (January 2007) explains why so few are interested. It is also possible to get an unlimited ADSL connection. Of course, everything is possible as long as you pay. The fee for unlimited traffic at 2048 kbps (kilobit per second), including VAT, amounts to more than 3,700 euros a month. For a big part, thanks to monopolist Kazakh Telecom. To get the picture clear: in Amsterdam I pay about 70 euros a month for an ADSL connection with speed of about 5400 kbps. Even I – living in a comfortable double income household without kids – can not afford a Kazakh ADSL connection.